KML Camera automatically creates geo-referenced files containing pictures, text, movies with sound, and photo overlays that you can display in KML Map, Mapster, Google Earth, and other geospatial applications. Keyhole markup language (KML) is a standard format used by Google Earth and other mapping and navigation tools to represent geographical information. KML Camera runs on all iOS devices with a camera and GPS. The current version lets you store photos in up to six separate camera rolls. 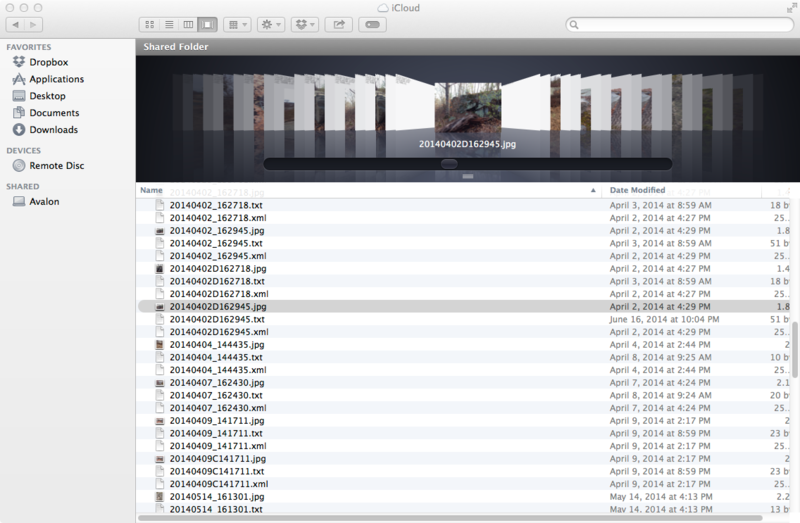 Photos, metadata, KML, and HTML files can be uploaded to iCloud or downloaded to your computer using iTunes file sharing. The main menu contains a view control bar (top) and tool bar (botom). 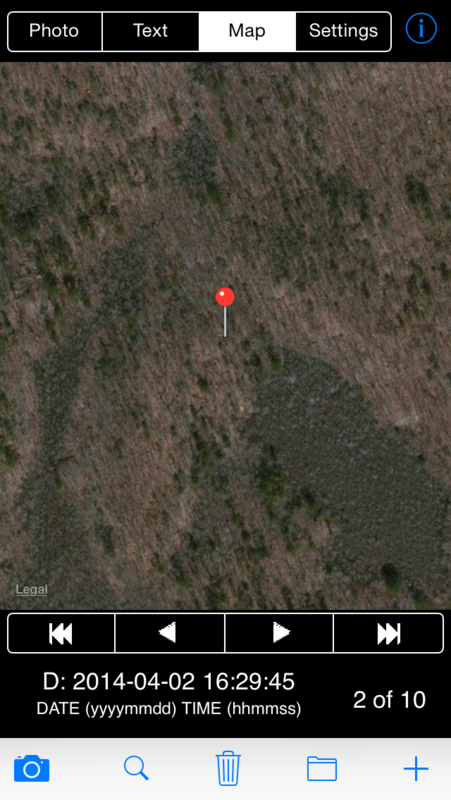 As shown below the view controls let you view a photo, any descriptive text, and its location on a map. The camera roll control is located below. Tapping these controls moves through the list of pictures you have taken. The date and time of each photo is shown below the controls. Photos are organized into six separate camera rolls (_,A,B,C,D,X) indicated to the left of a picture's date and time. The photos shown here are in the D roll. 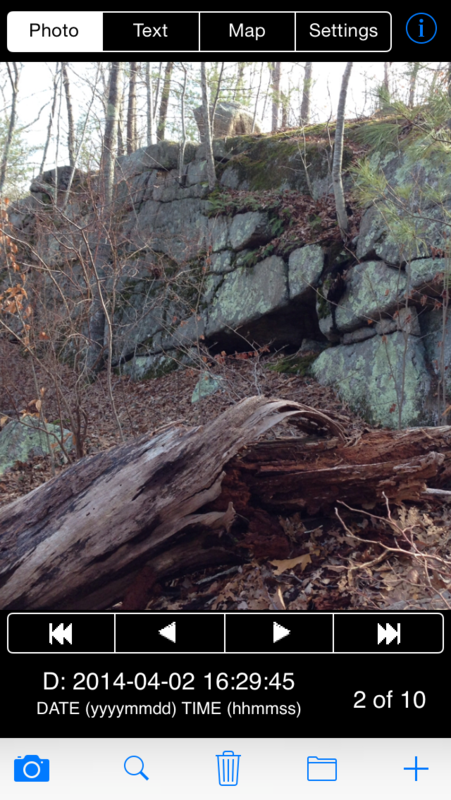 Tap the camera icon (left button in bottom tool bar) to take a new picture of video at your current location. Hold the device steady to accurately capture the look direction and tap "Use" to save the picture or video. The location and position of the camera is recorded at this time and a new entry is created and added to the camera roll. There are three internal files for each entry in the camera roll: a JPG image or MOV video, text file (.txt), and .xml metadata. The .txt and .xml are internal files. In addition, each time a new picture or movie is taken, a new KML file is generated for all of the entries in the camera roll, and a HTML file is created that lists all of the pictures/videos in time sequential order. These files can be exported to iCloud or transferred to/from the document directory using iTunes File Sharing as described below. Switch to the text view to add descriptive text to a picture or movie, which can be later viewed along with the photo on a webpage or in Google Earth. Tap Done" to dismiss the keyboard. Tap the search button (second button from left in bottom tool bar) to find a picture or movie in the camera roll by descriptive text that you have previously entered in the text view. Tap the trash can (middle button in the bottom tool bar) to delete a picture. This operation cannot be undone. Tap the folder icon (second button from right) to move photos from one camera roll to another. 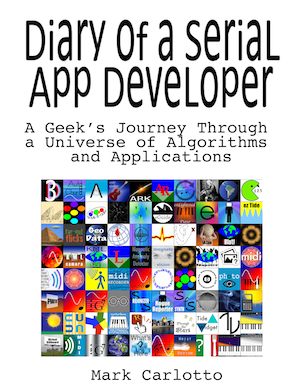 Each camera roll has its own HTML (webpage) and KML files automatically generated by the app. Tap "+" (right button in bottom toolbar) to import photos with EXIF picture latitude, longitude, and direction information to KML Camera. Camera Roll - Selects where new pictures are stored. To move a picture to another camera roll, tap the organize button (second button from right in bottom tool bar). Save to Camera Roll - Saves a copy of any pictures and video you take with KML Camera in the device's Photos app. Time Index - If this option is on, the KML file generated by the app will be time stamped. Save KML as Photo Overlays - If this option is on, the KML file generated by the app will contain photo overlays. Picture/Video Quality - This specifies the quality when the photo or video is taken. Recommend low or medium quality settings. High quality generates large files, particularly for video. 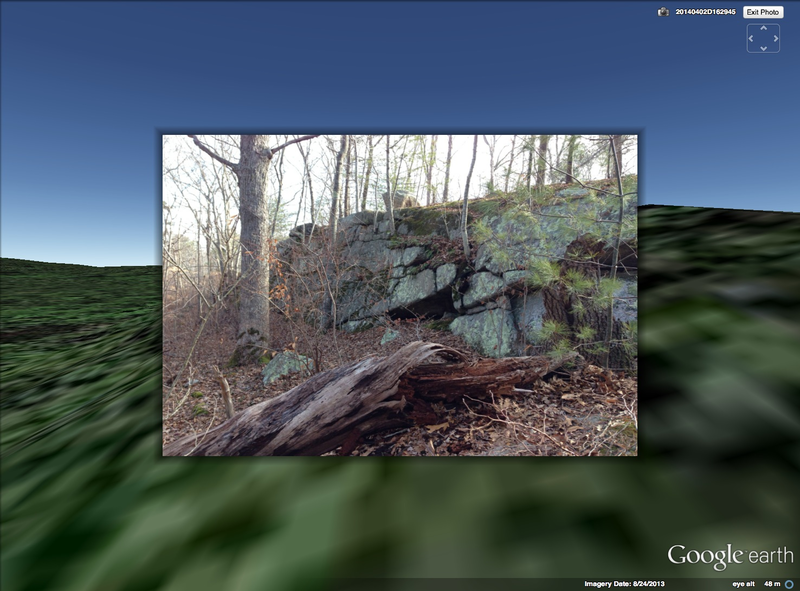 The following is a photo overlay shot with KML Camera displayed in Google Earth. The map view at the bottom of the settings view shows your current location and provides a visual indication of the accuracy of the GPS. Check this display before taking a picture or movie to insure your data will be accurately positioned. 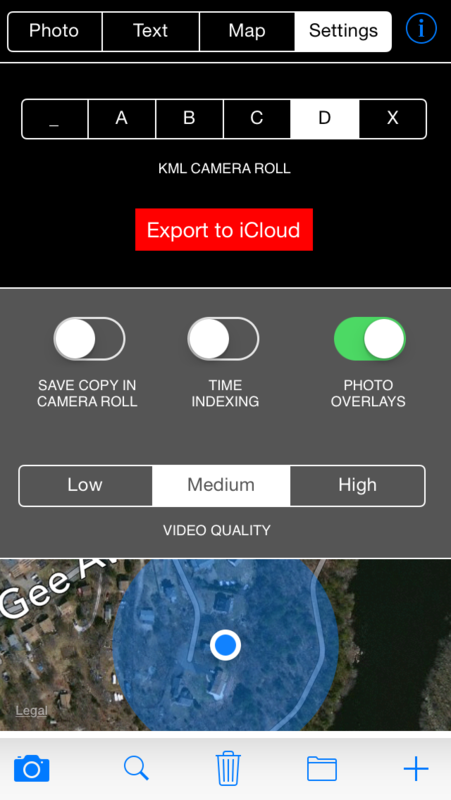 Tap "Export to iCloud" to upload .kml, .html, .jpg, and .mov files in the selected camera roll to your iCloud. 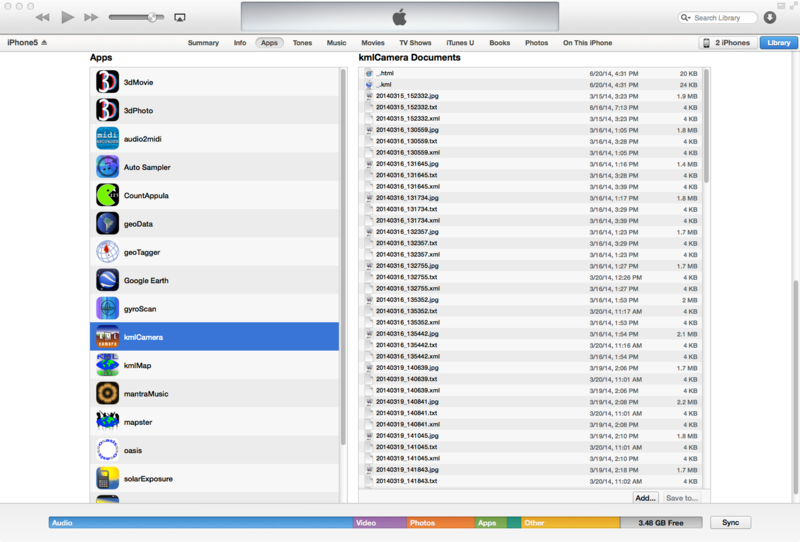 All files are transferred to the KML Camera folder in the iCloud directory on your computer. N.B. The app does not sync photos between iOS devices. These files are also accessible from your computer via iTunes file sharing. To access these files, plug the device into your computer, select the device, select apps, and find KML Camera. When you select KML Camera its documents directory appears to the right. Files may be dragged between this directory and your computer.